Global flooring demand is forecast to rise 3.1% per year to 21 billion square meters in 2022, valued at $226 billion. Gains will be driven by increased construction of new buildings, rising spending on improvement of repair of existing buildings, and – to a lesser extent – growth in production of motor vehicles and other transportation equipment. The Asia/Pacific and Africa/Mideast regions will account for 75% of global flooring demand gains in area terms through 2022, with China remaining by far the largest national market worldwide. Particularly fast growth is expected in India, boosted by increased industrialization and urbanization. Rising standards of living in these regions will also result in greater use of finished flooring relative to total floor space. While nonresilient products will continue to comprise the largest share of demand, faster gains are expected for resilient flooring. In particular, demand for vinyl flooring is being boosted by advances in digital printing that have greatly improved the aesthetic qualities of these products. Luxury vinyl tile (LVT) will continue to achieve increased market penetration after growing quickly between 2012 and 2017. In addition, emerging multilayer flooring products such as wood-plastic composite (WPC) will rapidly expand their market niche from a small base. Global demand growth for carpets and rugs will trail that for other products, continuing a long-term trend. The weak outlook for these products is mainly due to a relatively high concentration of demand in developed markets in North America and Western Europe, where market maturity contributes to overall sluggish growth. Carpets and rugs also account for the bulk of demand in the transportation equipment market, which is expected to post weaker growth than building construction markets. 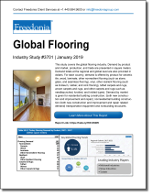 This Freedonia industry study analyzes the global flooring industry. It presents historical demand, production, and net exports data (2007, 2012 and 2017) and demand forecasts (2022 and 2027) by product (nonresilient flooring, resilient flooring, carpets and rugs), market (residential buildings, nonresidential buildings, transportation equipment and other), and region (North America, Central and South America, Western Europe, Eastern Europe, Asia/Pacific, and Africa/Mideast). The study also evaluates company market share on a global basis and the competitive strategies of key industry players such Beaulieu International Group, Mohawk Industries, Shaw Industries (Berkshire Hathaway), and Tarkett. Flooring products composed of hard-surface materials that lack elasticity, such as ceramic tile, wood, and laminate. Flooring products composed of firm materials characterized by their ability to regain their shape and appearance after a heavy load is applied to and then removed from the floor surface, such as vinyl, linoleum, and rubber. Soft-surface flooring products. Mainly consists of textile products, but also includes products such as artificial grass and straw mats. “Carpet” typically refers to products which are fixed in place, while “rug” refers to products that are laid on the floor, often on top of other flooring products.